With my original traffic light for High Speed consisting of melted plastic held together by black electrical tape, I have been searching for a replacement traffic light. 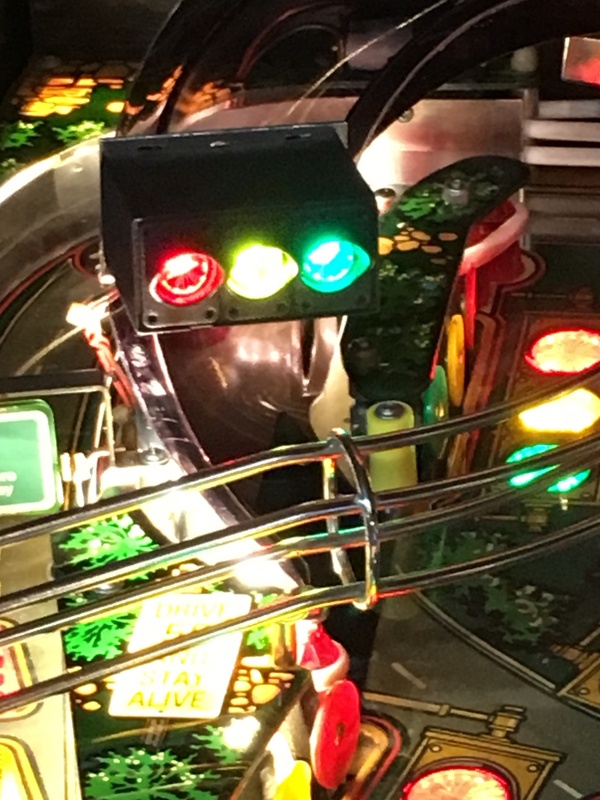 In reading various posts on this forum it is clear that no original replacements can be found.Checking with Terry at Pinball life revealed that a modified replacement prototype has been made but the cost would exceed $50. Terry did not feel that there would be enough demand to justify production by a third party, but he graciously offered to produce one if I wanted. 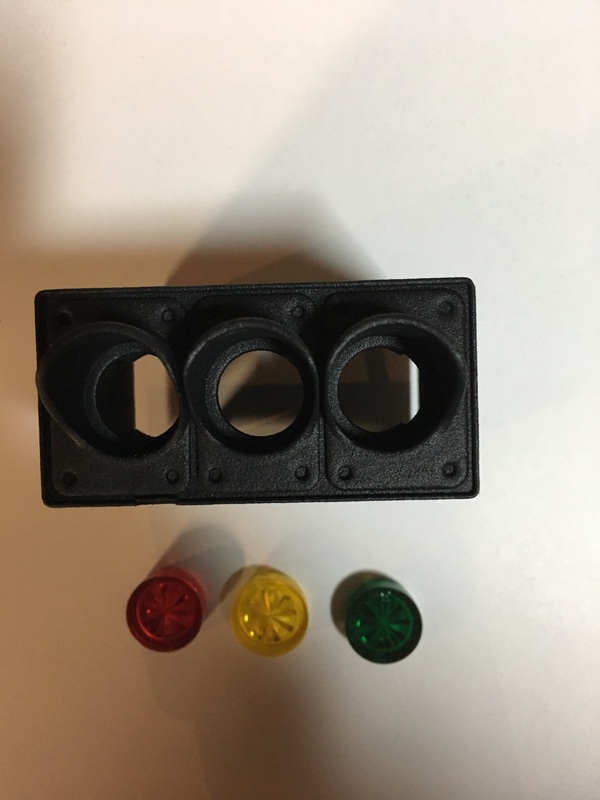 Wanting to check it out for myself, I contacted Langless28 who had two 3D print files for a modified traffic light (one horizontal and one vertical) which he graciously shared with me. 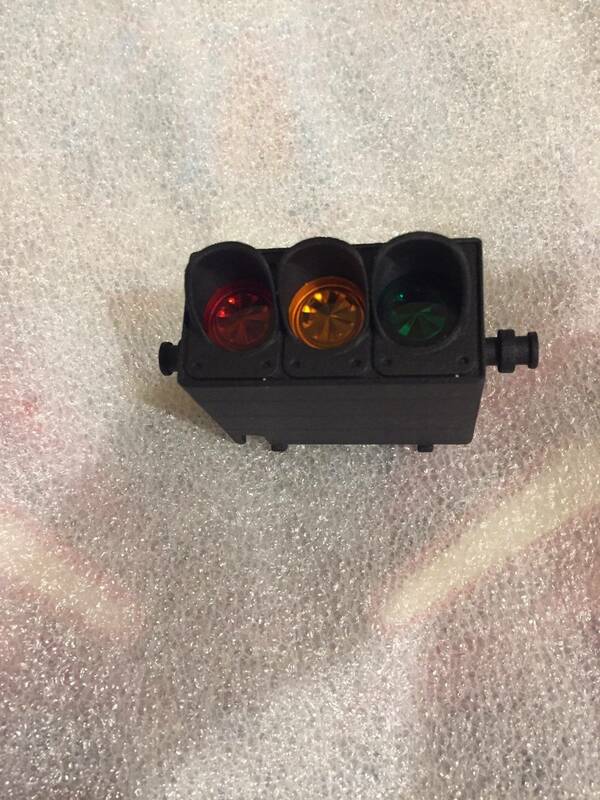 I sent one of his files to Sculpteo, a 3D online printing service, and they produced the traffic light pictured below. I ordered the 50 cent lenses from Pinball Life and they clicked into place perfectly. I was worried that the tabs on the light which connect the plastic to the metal base would break, but they fit perfectly. My total cost was right around $40 for a light which is stronger and more heat resistant than the original. 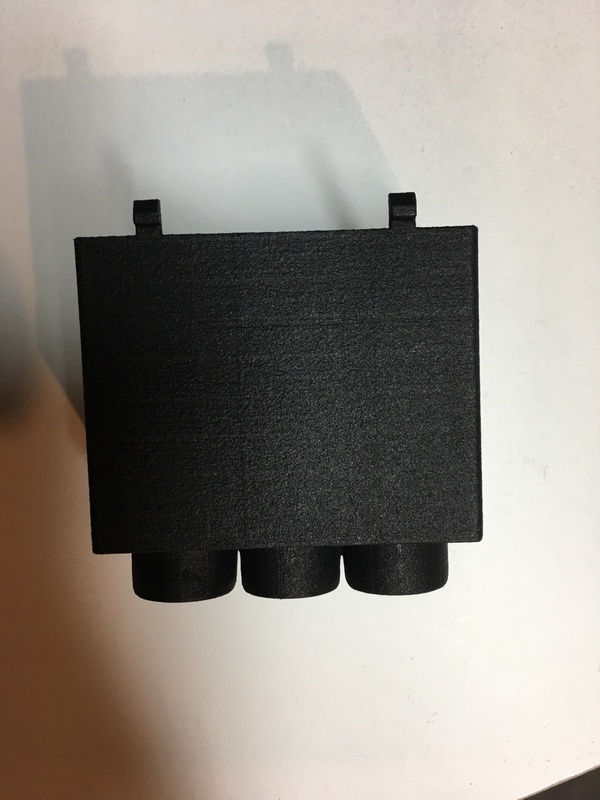 I selected the MultiJet Fusion PA 12 material dyed with Color Resist Black from the 3D printing company. There are probably cheaper materials and printers out there if someone wanted to take the time to check them out. My only slight negative about the light is that the realistic looking hoods over the 3 lights tend to cover a bit of the lights such that they are not as bright as before, but this is barely noticeable. Thanks to all who have posted and contributed on this issue. Wow, looks great! Been looking for a replacement for mine for 2 years. I’d settle for just the plain black box the original is. Glad you like it. Do you mean the light hoods project too far out? I can shorten them. Also .stl files for these lights are free for anyone who needs them. 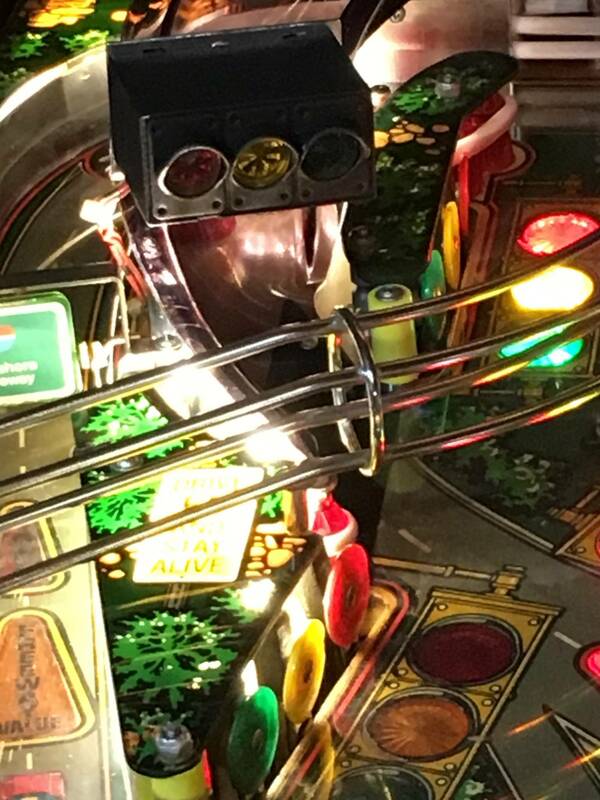 Yeah, it looks great in the pic, but if they obscure the light when you play I think maybe shortening them would help. Got a pic with it in the game you can share? That looks awesome. I wish I could get one for my High Speed!! I made another horizontal version where the hoods project 3/8" out instead of the original 1/2". Attaching a photo of the light installed. From a playing angle there is probably 1/3 of the light obscured by the hood. For pure visibility I would do a very small hood, maybe 1/8", or none at all. The fit and finish of the basic design is amazing ,however. I can't get over how well the tabs fit and the tight tolerances on the lens openings. If a new one is designed with a smaller hood or no hood I would like to receive the file. Thanks again to Langless28. Just bend the bracket upwards to align it more with your eye level. Thanks. I did bend it and achieved about a 90% improvement. Could have gotten 100%, but was afraid I might break the bracket. I'm considering getting one made. langless28, I hate to ask, but would you consider removing the 'extra bits' on the sides? I love the look of the front with the hoods(I'd prefer the slightly shorter hoods) and the detail around each light, but would rather the sides not have the 'bolts'. Or I can try modifying the .stl myself (always looking to try something new). 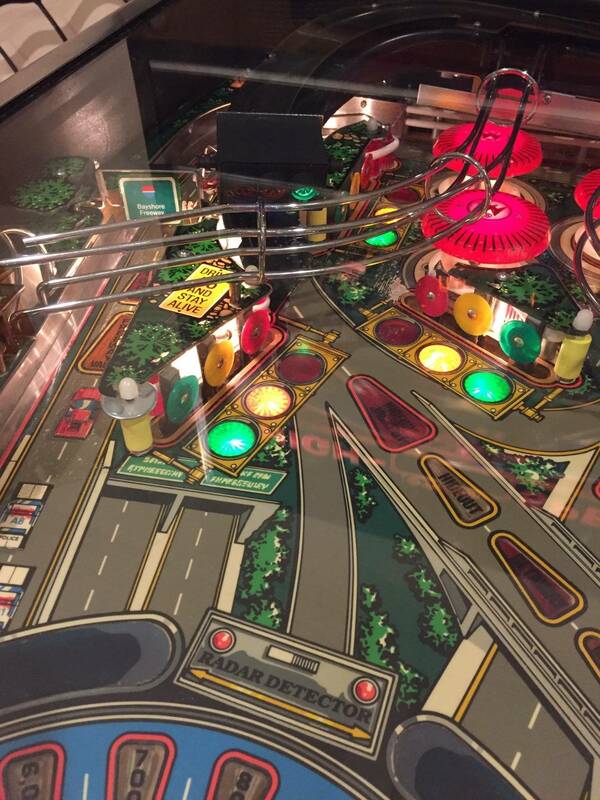 Also, what's the size of the jewels inserts to order from Pinball Life? Thanks langless28 for the work you've put into it and thanks to eckhart for sharing what his looks like! I can remove those parts. I originally designed this to be remote mounted and used those standoffs to drill in small rods to mount to the backboard. Similarly to how a real traffic signal is mounted. Just pm me and I'll get you a link. I have 2 High Speed machines. One light is hanging in there, the other is toast, but that doesn't matter until the Hardtop exists. I don't want to come in here and turn into a "Me Monster", but I have an injection molding machine that would likely be able to make these. It's a reasonably recent purchase for me, but I have another hobby that I've been able to make some parts for. I'd like to look at making these if that was something people would want. 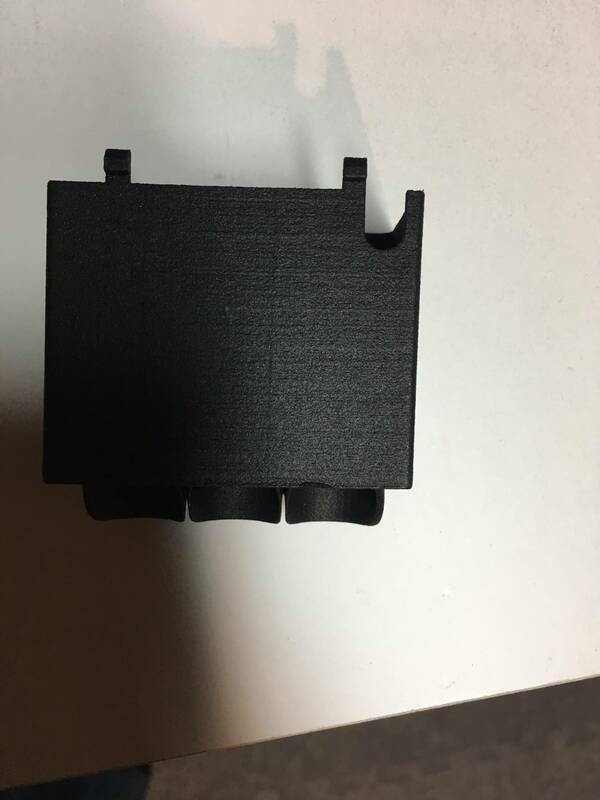 There is a lot that goes into molding parts (time, cost, trial/error refining the process for that specific part) so I won't make any promises. However, if there is demand I'll give it a go. 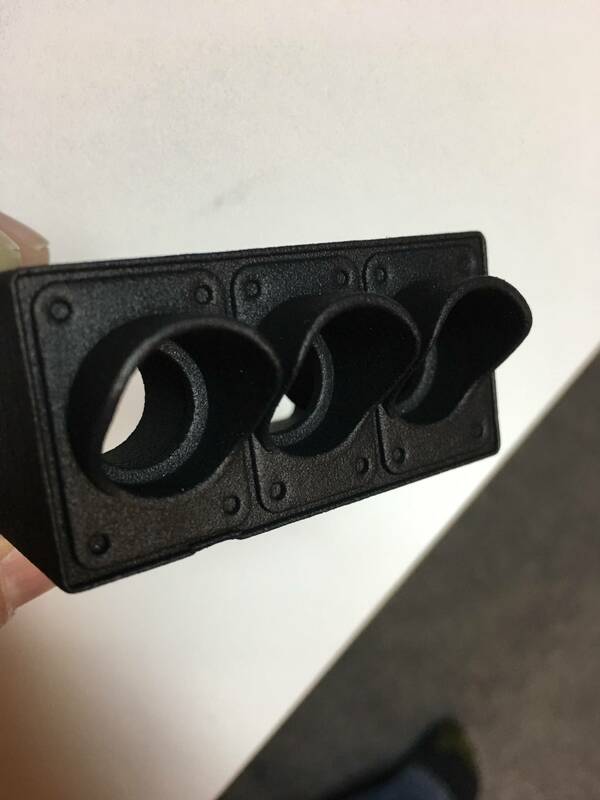 No estimates on cost or timing, but costs should be about what prints cost, but with a smoother surface finish. I'd want the most appealing single design from langless28 and then I'd have to do my thing. Then if/when they go up for sale Mr. Lang would get some royalties for providing the model. I'd like to see how this looks with the rear mount the way Langless is saying it was intended for. I figured the side pieces were intended for some installation option, and your explanation of remote mounting makes sense. I was originally going to remote mount mine once I got my new ramp from FreePlay40 (clear ramp, but smoked; absolutely LOVE it). I even got the extension harness he sells to do it, but decided to mount mine on the ramp anyway. Looking forward to it. Will post when I get it back and installed. It was intended for that. I sold my high speed before I got to install it in my machine. I can send you whatever you would like. We actually had 5 of these made with a ultra-high end 3d modeling machine. We are currently gluing in the inserts and clear coating the assembly. They should be ready by the end of the seek. It's not a cheap way to make a part and I suppose the price police will be all over us, but enough people expressed interest at the price point we estimated it to be, so 5 of these should be available for sale by the end of the week. I would have bought one immediately if I hadn’t already gone ahead with sending one of langless28 ‘s designs (he graciously made minor modifications I requested: shortening the hoods 1/8” and removing the bosses from the sides, thanks Mike!) to Sculpteo (following eckhart ‘s recommendations) for printing. It is scheduled to be here Monday (from France). Today I received the lenses from Pinball Life. Once I have it assembled and in my game, I’ll post pics. Thanks to everyone for their input/help! Let me know, I'm interested in one. I literally posted the link to it. Sorry, im looking for the cover that was made by a 3d printer in plastic. It resembles a real stop light unlike the original that's just a sqaure. Mail from France came today and I’m REALLY impressed. Sorry if the “in-game” photos don’t come out right (LEDs wash them out a bit and the cool white under the ramp entrance is probably too bright). The “all on” photo is during attract mode. Glued the lenses in and had it all together in minutes. Tabs are perfect. Fit is terrific. My only issue is that since I switched to Freeplay40’s smoked ramp, I positioned the light slightly too high on the ramp entrance. So my glass BARELY clears the traffic light. But that’s on me and I made it work. Thanks again to eckhart for starting the thread and a HUGE thank you to langless28 for offering the models (for free) and being willing to make some requested edits. After 2 years of looking for a replacement, this is a great improvement over the original design in my opinion. Glad you like it! Looks awesome. Makes me wish I still had my high speed. 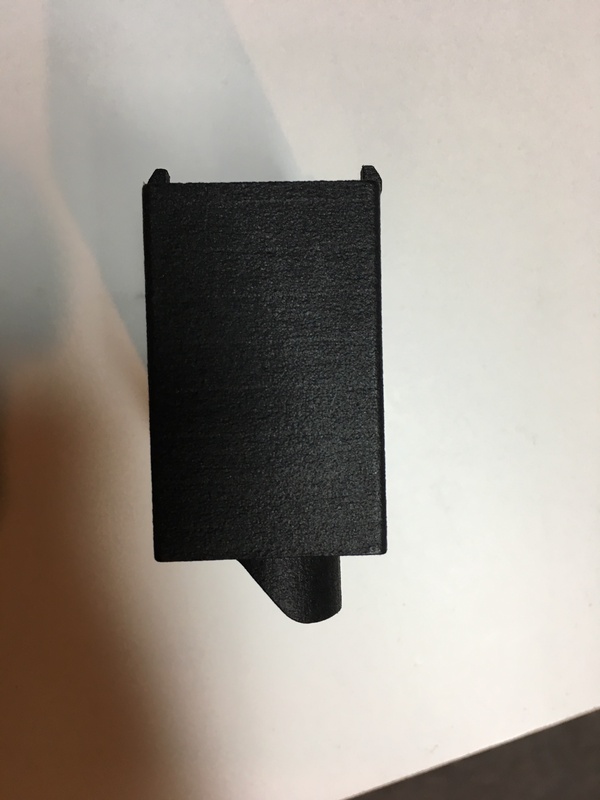 Send a PM to Langless28 he made the .stl.files and he will be more than happy to help you. I printed his stop light in yellow and remote mounted it in the ledft rear corner. Looks amazing. I did, and thanks! Think I get both styles just in case I upgrade the ramp and move the light to the corner. You have any photos of this remote mounted yellow stop light?